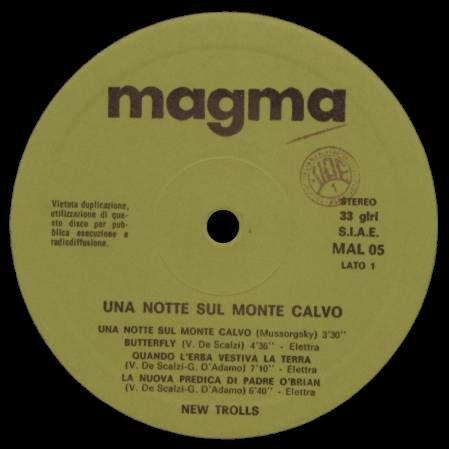 Founded in Genova by the De Scalzi brothers, Vittorio well-known with his New Trolls, and the younger Aldo (founder of Picchio Dal Pozzo), Magma was a sort of appendix to their recording studio, the Studio G.
The label had two different phases, the first one from 1973 to 1974, when it was distributed by Dischi Ricordi, then after a two years spell it returned with a new design mainly producing old bands and with distribution by Fonit Cetra, while in the same years the newly born Grog concentrated on new artists and groups. During this short period, they released some of the best Italian prog records of the 70's with Alphataurus' first and only release, New Trolls Atomic System's albums, New Trolls' Concerto Grosso n.2, Latte e Miele. The records released have different numbering for the two periods, with MAGL/MGL series and first design label for LP and singles made between 1973 and 1974, most with beautiful gatefold or gimmix covers, and 1976 released MAL/MAG series with cheap covers and later design labels. Totally different (and not particularly relevant for this site) is the SMAG series of LP's, also from 1976 and containing lightweight and mostly instrumental pop music records, many of which only issued with standard blank covers with the Magma logo and probably only distributed in small quantities and promotional form. Apart from these SMAG series issues, as you May see in the listings below, the Magma label released some very good products along with some trash singles, and the same thing happened with sister label Grog. Some of the artists signed to the labels appeared on both of them, this was the case with Latte e Miele and folksinger Piero Montanaro. 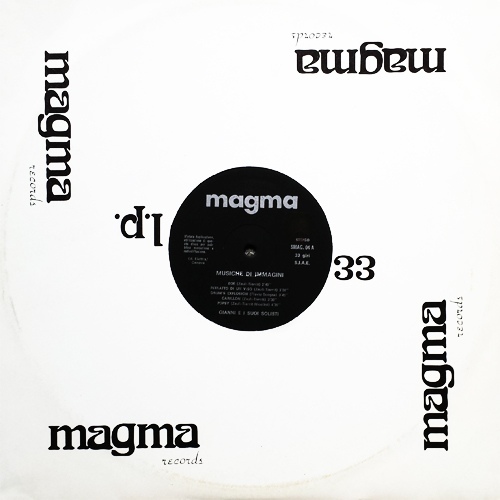 The Magma name was revived during the 90's by Aldo and Vittorio, who released on this label, under the name De Scalzi Bros. some CD's and 12" singles in commercial style, some of which dedicated to their favourite football team, Sampdoria. All the labels are identical on both sides. First design labels are yellow with a multicoloured design on the upper side. 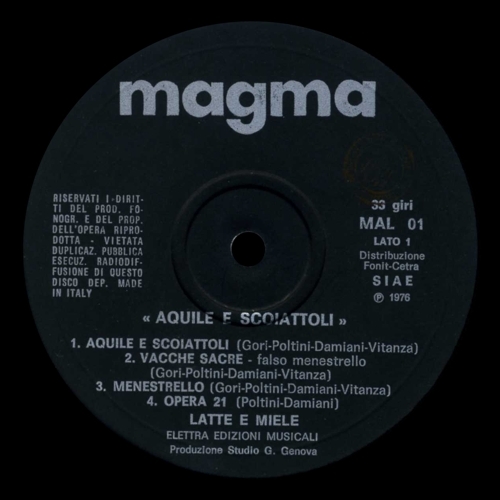 Second design labels (MAL/MAG 1976 series) have a black/silver label similar to the one of Fonit/Cetra who had acquired Magma, some of these albums were later reissued with an olive green label in 1979-80. Piero Montanaro's single La langa was issued both on Grog and Magma label, though the vinyl has the Grog catalogue number machine.stamped in the run-off groove. 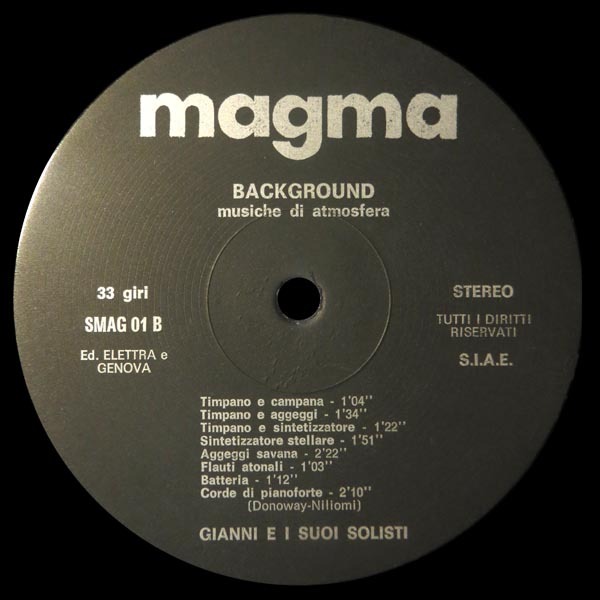 A 1973 ad for Studio G, to promote their Magma and Area labels, mentioned among the scheduled releases Cinque sogni e una burla by the Genoa group La Piccola Famiglia, with number MAGL 18004. That record has never actually been released and the catalogue number was used for the LP by Johnny dei Tritons. - SMAG 01-06, credited to Gianni e i Suoi Solisti, with many tracks written by Gianni Mazza, Vittorio De Scalzi (New Trolls), Aldo De Scalzi (Picchio Dal Pozzo), Lelio Lagorio (Il Sistema, Celeste), Massimo Catalano (Flippers). - SMAG 01, Background - Musiche di atmosfera contains a track called Flauti atonali which is the flute part, here in integral version, of Napier from the first album of Picchio Dal Pozzo, and Aggeggi savana, which is the instrumental version of Seppia from the same LP. All the tracks on the album are written by Donoway/Niliomi. - SMAG 02, Musiche di sensazioni contains Multistrati which is in fact Cocomelastico from the first album by Picchio Dal Pozzo, here in an instrumental version. - SMAG 03, Musiche stellari contains many tracks from the Sigillo di Horus album. The whole album is credited to Zauli/Territ. - SMAG 04, Musiche d'immagini contains the whole Pavana by Latte e Miele. - SMAG 05 e SMAG 06 contain tracks all written by Mazza/Catalano/De Scalzi/Lagorio. - SMAG 07, A luci rosse by Tony Lamberto (the only album in this series to have a picture cover), contains tracks by Giggi Mosello and Beppe Aleo, members of I Signori della Galassia. According to some sources the album was issued in 1981 and not 1976 as all the others. Moreover, the SMAG02 LP (Musiche di sensazioni) was also distributed in a gatefold cover with the title Occasioni (Serierossa SR3).